Man began to inhabit Korea in the Paleolithic Age(ca. 700 thousand B.P). In the Neolithic Age, which lasted from around B.C.6000 to about B. C. 1000, people subsisted mainly by plant gathering, hunting and fishing. It is assumed that in that age they began to engage in farming. The inhabitants in the Bronze Age (around B.C. 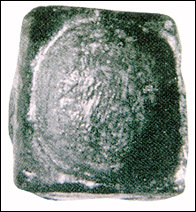 1000) are believed to have used the new metal-working technology. Fullfledged farming started in the Bronze Age. The iron culture, introduced around the fourth century B.C., deeply influenced the inhabitants to make remarkable developments in manufacturing iron implements and earthenwares through the early Iron Age up to the formation of ancient Korean states in the third century A.D.. There is a record that one of the ancient states, Pyonhan located around Kimhae of the present country, exported a great quantity of iron to Nakrang, an ancient country that existed in the Manchuria area and Japan. In the Three Kingdoms period, the Three Kingdoms(Koguryo, Paekche and Shilla)developed political, social and economic systems independent of each other, and were later combined into the United Shilla. Buddhism which was introduced during the Three Kingdoms period grew and flourished, leaving deep foot prints on both the spiritual and living cultures of the United Shilla. A woodblock-printed scroll of Dharani Sutra found in the Sokka Pagoda of Pulkuk-sa Temple, constructed during the Shilla period has proved to be the oldest woodblock printing, dating before 751 A.D.. The Koryo Kingdom(936 - 1392) developed more advanced political and social systems by adopting the State Civil Service Examination(Kwage) and, the Stipend Land Law. Also Buddhism was still kept as the state religion. 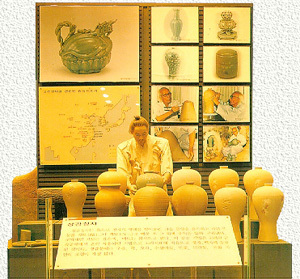 The highly developed culture of Kore is represented by the beautiful celadons with their incised designs, Tripitaka Koreana engraved on over 80,000 woodblocks in Haein-sa Temple, and the world's first movable metal types and printing of Kogkm Sangchong Yemun (Prescripted Ritual Texts of the Past and Present) are dated at 1234. In the Choson Kingdom(1392 - 1910) Confucianism was the basis of political, social and enonomic systems. In particular, the creation of Hangul, the Korean alphabet, and the development of science and technology during the reign of King Sejong were the epochrnaking events in the development of Korean culture. 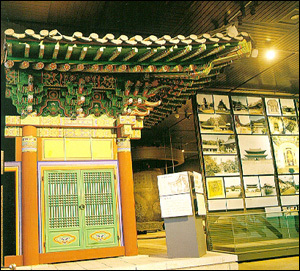 The present Korean culture, including occupation, houses, religion, scripts, architecture, science and technology are the result of this evolution of history from the prehistoric age in Korea to the present. Because Korea has a variable configuration on topography, a great diversity is shown in foods. Various grains have been grown since the ancient period. Later rice cultivation was introduced and became the most wide spread. Consequently, many kinds of grains, including millets, beans, red-beans and barley with rice as the staple grain, are the foods of Korea. Also, various plants from mountains and fields are prepared as vegetables. The basic Korean traditional costume consists of a jacket and trousers for men, and a jacket and skirt for women, and overcoats and headgear for both sexes. In the early days, the clothes were only for protecting the human body from the cold or heat, but the aesthetic purpose was gradually added to this basic function with the development of various dyeing techniques, although the application of color was limited by one's social status. People first lived in caves and dwellings built with untreated woods and these were gradually improved to the forms of pit- house, log huts and grass - thatched or tile- roofed houses. The traditional houses varied in form and scale depending on the status of the occupants, and have developed according to the demands and climatic of social, oher environmental circumstances. 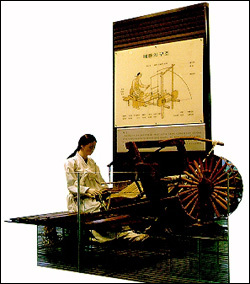 The loom was designed to move the harness up and down by ma m ipulation of the foot. After the shed is prepared, the boatshaped wooden shuttle would side to the rihgt and left on a set of wraps. It takes 20 - 30 hours to weave a eoll of textile (0.9 * 36m) depending on the kind of fabeic or the weaver. 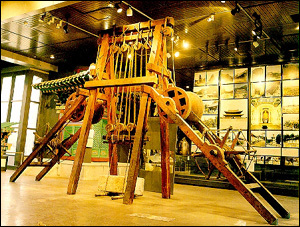 Chong Yak yong devised an instrument incorporating a pulley and crane to construct a rampart in Suwon ( Hwasong, Korea's emergency capital) based on the following principles: One pulley with 50 Kun (30kg)of power could lift a weight of 100 Kun (60kg), and two pulleys of 25 Kun (15kg) could pull the weight of 100 Kun(60kg), and in turn four pulleys in two units of 40 Kun (24kg) each could pull up the weight of 1,000 Kun(600kg). At the minimum, he could lift a total of 25,000 Kun (15,000kg ) by using his device, so that the walls and fortress were constructed with considerable effort saved. His construction plan with diagrams was published with the title of Hwasong Songyok Uigwe in 1800. Tanch'ong is a technique which describes landscapes, animals, flowers and birds with five natural dyes symbolizing the points of the compass, east(blue), west(white), south(red), north(black) and center(yellow) on Buddhist, Taoist or Confucian structures and other official buildings. The oldest Tanch'ong has been discovered on mural paintings in the ancient tombs of Koguryo and Shilla Kingdoms. It is said that copper began to be used in West Asia around 5000 B.C.. A mixture of copper, tin and bronze, was the first copper mixture. Copper mixtures are classified as bronze, brass, cupronickel and red-copper according to the kinds of mixed materials. We can find zinc in Korean copper mixtures, although it might has been very difficult to mix zinc and bronze together in the past since zinc melts at 450C and boils at 950 C,hile bronze's melting point is higher than 1,000C. Therefore, it is clear that Korean metallurgy was more advanced than that of China at that time. 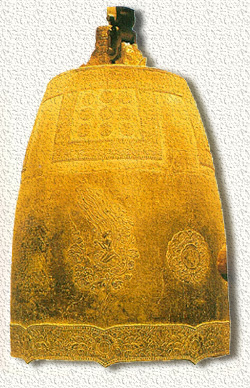 The Divine Bell of Songdok began to be manufactured by King Kyongdok(A.D. 765) to commemorate his deceased father King Songdok and was finally completed under King Hyegong(A.D.771). This is the largest ancient bell still remaining (height of 333cm, diameter 227cm). This beautiful bell with devas embossed around its trunk produced a mysterious deep sound svoking one's religious emotions. 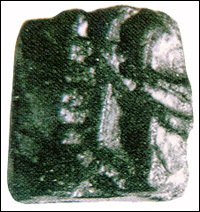 Movable metal type was developed to resolve problems associated with woodblock printing such as time - consuming engraving. The Kotyo record that the 50 volume Kogum Sangjong Yemun(Prescribed Ritual Text of the Past and Present) was printed with cast metal around the 21st year of reign of King Kojong(around 1234 A.D.) refer to the oldest metal type printing in the world. Nammyongch'onhwasang - Songjungdoga(Sermons of Sung Buddhist Priest Nammyongvhon) was first Printed with cast metal type in the 26th year of the reign of king Kojong(1239 A.D.). 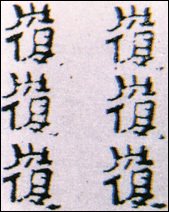 A woodblock edition of the based on the metal type version is extant. Moreover, there is a copy of the movable metal type - printed Chik - chisimgyong, a buddhist commentary, date to the third year of rule of KIng U(1377 A.D.)and printed at Hungdok - sa Temple near Chongju, masking it the oldest extant movable metal type - printed book. Korean Music Playing With a long historic and unique cultural background. 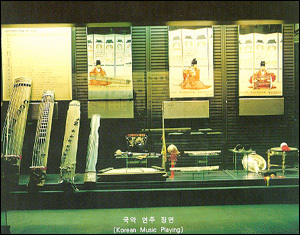 Korea established its own characteristic musical tradition distinct from those of China or Japan. Korea traditional music can be classified into three categories, court music, folk music and religious music. Also the musical instruments have developed independently of neighboring nations beginning from the Three Kingdoms Age. The typical instuments are the Komungo(six-stringed instument), Kayagum(twelve-stinged instument), Hyang Bip'a(Korean straight-neckd lite), P'iri(bamboo oboe), Kwaenggwari(small gong), ching(large gong)and Changgo(mourglass-shaped drum) etc. These instuments are classified into 'eight sounds', according to the kind of manufacturing material : namely, metal, stone, sulk, bamboo, gourd, earth(or clay), leather and wood. Paper, as we know it today, came into existence around the early 2nd century. 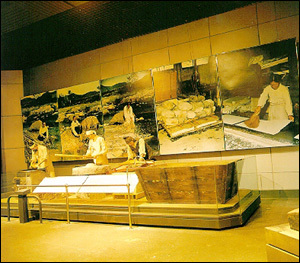 In Korean, also use of paper seems to have begun around that time because the remains of paper were excavated from Ch'aehyopch'ong, an ancient tomb of Nakrang. Korean traditional paper made mulberry tree is strong in durability and insulation. It has been used not only for printing but also for preparing walls and Ondol floors. In the beginning of the Koryo Dynasty, the ceramics were imitations of Sung Pottery, but Korean showed an unique beautiful creation, Ch'ongja in the early 11th century. The early products were added to the surface later. Uitimately, the inlaid celadons with engraved parts filled with white and black clay came to be regarded highly. This unique inlaid pattern of simple celadons is considered one of the ideal aesthetic forms. (Tower for Star Observation : The oldest astronomical observatory in the world was built in 647) As extraordinary attention is paid to atmospheric phenomena, rainfall or wind. in agrarian countries, astronomical observation has also traditionally been of great importance in Korea, too. 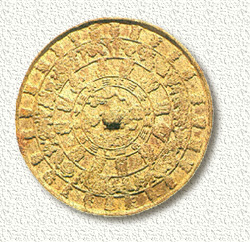 As a result, Korean astronomists obsserved eclipses in the early days and invented various astronomical instuments such as astrolabes, armillary sphere, celestial globe and sundial. In partucular a raingauge(pleuvometer)invented in Korea in 1442 preceeded the western one by two centuries. 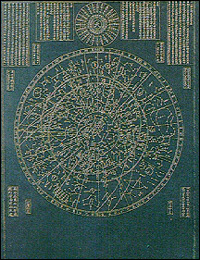 King Taejo founder of the Choson Dynasty, wanted to have a new astronomical chart as a symbol of royalty, and his wish was realized as Sokgakch'onsangyolchabunyajido. This chart with 1,464 stars was first engraved on a strong on December of A.D. 1395, and then remade by referring to rubbed copy of the original to restore some parts defaced by weathering in 1687. This water clock was built and set up in the Porugak(the Announciating Clepsydra Pavilion)by Chang Yong-sil according to the command of king Sejong on September, 1443. This is equipped with an elaborate jack-working device which is capable of announcing hours, intervals and night warches autonomically. 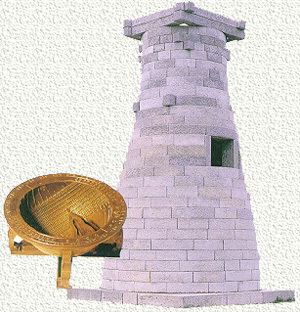 Ch'ugugi(rain-gauge)was invented in the 23rd year of King Sejong(1441), Choson Dynasty, and is the oldest scientific rain gayge in the world. 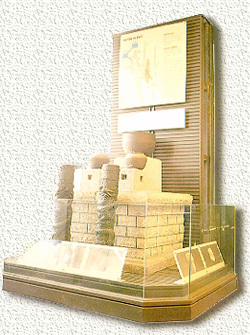 It consists of three parts ; a cylindrical cast iron or bronze main body, a stone pillar(Ch'ugudae) on which the main body is placed, and a ruler to measure the depth of rainwater that was collected on the main body. Korean naval forces showed brilliant efforts during the japanese invasion(1592-1598)by making this world's first iron-clad galley under the leadership of Admiral Yi-Sun-sin, one of the greatest heroes in Korean history. 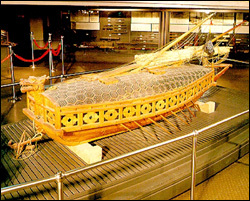 The Gobukson was well equipped with iron plates to protect rowers and armed with a large iron turtle head-shaped ram so that not only no weapons could destroy it but also troops could not march ahead. The Kukchooresorye(Introdutory remarks on national rituals) published in 1474 described the specifications of the firearms of King Sejong and Munjong's reign(1418-1452). 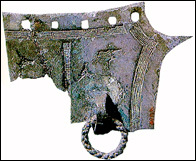 Development of firearms in the reign of King sejong was notable as a turning point in the art of casting. The Choson Kingdom stopped copying the Chinese model and created distinctively Korean styles. Hwach'a was designed in 1451 by Munjong(the 5th King of Choson). The cart body is parted from the axis so as to regulate the angle of the wheel from 0 to 45 degrees. 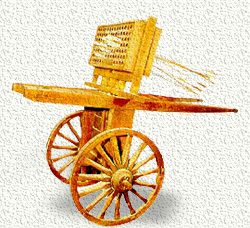 The cart is designed to use both the Chongtonggi (a launcher with 50 guns installed to shoot 200 thin arrows at the same time) and the Shingijongi (a launvher to shoot 100 medium or small rockets at the same time). In the time of peace, the armed cart without its launcher was used as a cart.